Mosiah. The name dances softly on the tongue. And guess what? So does Mosiah sauce, a creamy avocado condiment with the rush of fresh cilantro and a kick of lime. At Salt Lake City’s Faustina restaurant, Mosiah Sauce is the namesake of sauté chef, Mosiah Guerrero. According to Billy Sotelo, the restaurant’s executive chef, it landed on the regular menu as a result of a “family meal” -- a wonderful restaurant tradition in which various staff members cook for the crew, before or after a shift. “When it was Mosiah’s turn to make a quick breakfast family meal, he made capachas [Venezuelan street food -- a corn pancake served with soft mozzarella-like cheese] and served them with a sauce that was a surprise to my palate and instantly sparked an idea for brunch,” Sotelo told me. Good call, Billy. Like all great condiments and sauces, Mosiah is a game changer. 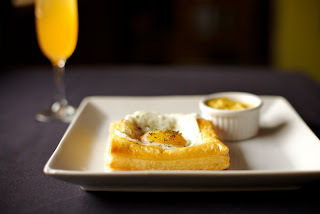 Sotelo serves the pale green sauce with his Black Forest ham and eggs, an egg and puff pastry brunch entrée. This welcome change from traditional eggs Benedict (as is the Faustina Benedict made with polenta and Italian sausage) is a veritable pillow of goodness, with melting jarlsburg cheese oozing out from beneath a runny-yolk (preferably, in my opinion) egg. The sauce also shows up with the bacon and egg cheeseburger. Mosiah and Billy kindly shared their recipe. 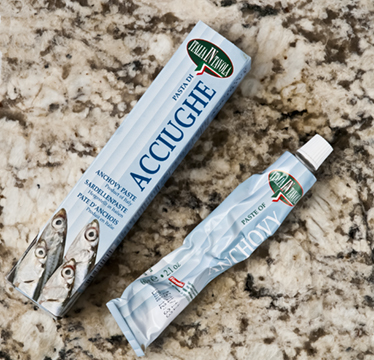 I’ll share this: You can also spread it in or over quesadillas, spicy grilled shrimp, and on eggs any way. It also makes a great condiment for chicken or lamb satays. And I have no doubt you can find some other excellent ways to consume this simple pleasure. Meanwhile, dining at Faustina is a pleasure at any meal – weekend brunch, lunch, or dinner. A modern neighborhood restaurant with some big-city pizazz, it also has a great little patio. From time to time I'll be sharing notes on house-made condiments from favorite restaurants. If you have one, let me know. Hello, bright yellow orbs of amplified flavor. A key ingredient and condiment in Indian and North African cooking for centuries, the intense flavor of preserved lemons lends itself to all kinds of dishes and drinks. Their texture is soft and pliable, with the taste of lemon heightened by the salt, yet softened by the gentle pickling process. Mainly, the peel of a preserved lemon is the star, but the flesh and the brine are also good in various incarnations (dirty martinis, anyone?). Some people rinse them before using, some don’t. It depends on how much salt you like. I think it’s best to just take a small bite first. If you like it, leave it as is. If not, rinse and pat dry. Since discovering these lovely morsels, I’ve always tried to make my own so I could call on them at a moment’s notice. But, I’ve been slacking and found myself searching for some commercially packed lemons to meet an immediate craving. Happily, it wasn’t that hard to track them down. 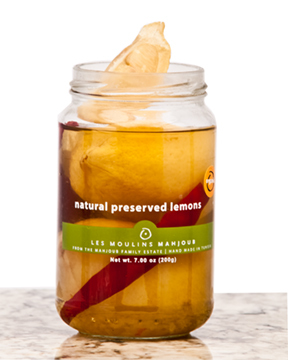 Les Moulins Mahjoub lemons beckoned from a display shelf the second I walked into Liberty Heights Fresh, a small but epic specialty foods store in Salt Lake City. They’re also available at Williams Sonoma and at any number of food outlets around the world. I liked the small size and the addition of a crimson pepper in this jar. The pepper didn’t affect the flavor all that much, but visually, it’s a great flourish. Chop and sauté with broccoli raab or any vegetable you think could benefit from a bit of salty lemon – carrots to squash. Serve slivered peel alongside smoked salmon or trout and capers. Chop and toss with cooked, chopped Swiss chard, orzo drizzled with olive oil, and freshly ground black pepper, all to taste. Finely chop with parsley and shallot and blend into soft butter to melt atop cooked fish. Stuff slivers under chicken skin with garlic, rosemary and thyme before roasting. Season couscous, rice, soups and stews. 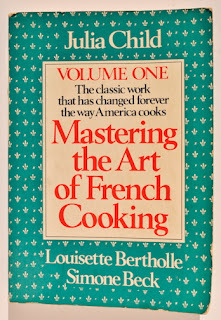 Chop fine and swirl into mayonnaise for dipping artichokes. Drop a wedge into a Bloody Mary or a sliver with some brine into an icy martini. Drink, then gobble up the preserved lemon as you would an olive. If you’re feeling adventurous, or if you already know the joys of a drizzle of olive oil and salt on vanilla gelato, try substituting a sprinkle of chopped preserved lemon. And don’t forget to eat some right out of the jar. Here’s a quick and easy recipe my friend Lesley shared by way of New York chef Tom Colicchio, a chef who seems to have a penchant for citrus and therefore, a chef after my own heart. If you have organic lemons, you can skip step one. With the addition of shallots and garlic, this version of preserved lemons takes on a sort of ‘relish’ quality, which is delicious. Plunge the lemons into boiling water to soften the outer layer of wax. Drain, rinse and wipe off the waxy reside. Dry the lemons. Slice lemons very thin; discard ends and seeds. Who doesn’t love jams and marmalades? Mason jars lovingly filled by friends and family, or by you. Local concoctions from the Farmer’s Markets. 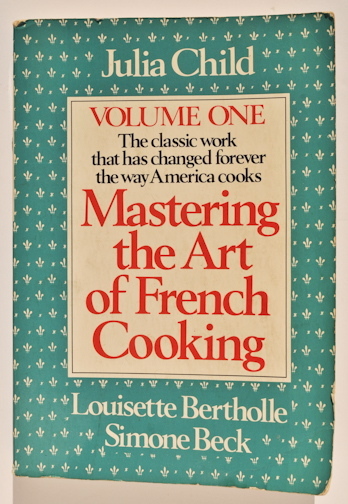 French confitures. Good old Smucker’s raspberry. Those tiny jars that come with hotel room service. I’ll take them all. Which brings me to Amour Spreads, lovingly made in Salt Lake City. On a chilly night last November, Pago Restaurant hosted a reception to introduce Amour Spreads with a menu of inspired presentations. I became an instant fan. And, it was a pleasure to meet the makers, Casee and John Francis, gardeners extraordinaire and the nicest people ever. 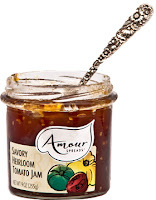 Together, they have created a knockout line of jewel-like jams and marmalades. That night we had our choice of 17 different flavors. Each was tempting in its own right, often with the subtlest of flavors melding together to seduce and draw you back for another taste. 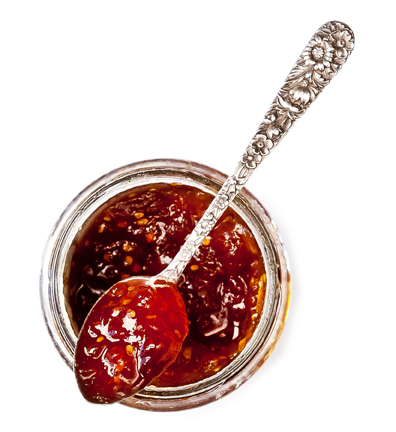 Think Pear Lavender, Apricot Rose, and Savory Heirloom Tomato Jam, and the ring-a-ding-ding of Cranberry Orange Marmalade. Find them in Utah at Caputo’s Market & Deli, Liberty Heights Fresh, Cali’s, and the Beehive Cheese Creamery Store, the Deer Valley Market and Café, online at Amour Spreads or local Utah food purveyor, Cahootal. 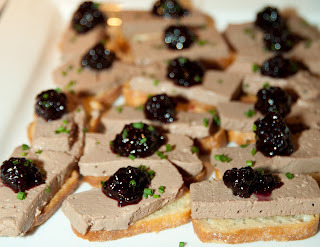 Amour Spreads Blackberry Jam and Pago house made pate on crostini was a classic. Find the rest of Pago’s tasting event menu on Amour’s Website. This is my (now empty) jar of Savory Heirloom Tomato Jam. I love a spoonful of it on top of soft scrambled eggs swirled with cheddar cheese. Casee and John grow and/or hand pick their produce and herbs. Fortunately, they have west coast friends with citrus groves! Look for these new marmalades, just released for Spring 2012. My favorite is the lilting, lightly floral Meyer Lemon-Rose Geranium. Blood Orange-Meyer Lemon is divine on its own or shaken in a good Manhattan. About all the love-spreading: Amour donates a percentage of its sales to a variety of local causes, detailed on their site.